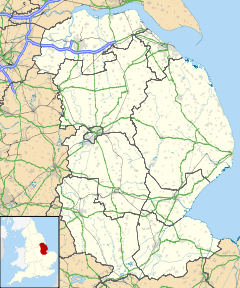 Amcotts is a village and civil parish in the North Lincolnshire district of Lincolnshire, England, and on the Isle of Axholme. The village is situated north-west from Scunthorpe, and on the west bank of the River Trent facing Flixborough on the east bank. The 2001 Census recorded a population of 219 for the parish, increasing to 262 at the 2011 census. Amcotts is listed in the 1086 Domesday Book with eight households. A chantry chapel was founded in the mid-15th century by Geoffrey Crowle and William Amcotts. Formerly a township of Althorpe parish, Amcotts was created a civil parish in 1866 and enlarged in 1885 by gaining part of neighbouring Luddington. Amcotts Grade II listed Anglican parish church is dedicated to St Mark, and was built in 1853 to replace an earlier church dedicated to St Thomas A Becket which fell down in 1849. Amcotts CE School, built in 1860 as a National School, closed in 1961. In 1974 properties in the village were subject to significant damage because of the Flixborough disaster. The hamlet of "Marae", or "The Marshes" now a deserted medieval village of which no surface evidence remains, was supposedly at the outfall of Mere Dyke on the River Trent, which is now in Amcotts, but then was in Luddington parish which extended to the bank of the Trent until 1885. At the time of Domesday Book of 1086, Marae was listed as having three households. ^ "Amcotts Civil Parish". Neighbourhood Statistics. Office for National Statistics. Retrieved 27 August 2011. ^ "Civil Parish population 2011". Neighbourhood Statistics. Office for National Statistics. Retrieved 18 April 2016. ^ Amcotts in the Domesday Book. Retrieved 27 August 2011. ^ Historic England. "Chantry Chapel, Amcotts (61147)". PastScape. Retrieved 27 August 2011. ^ a b "Amcotts". Vision of Britain. University of Portsmouth. Retrieved 27 August 2011. ^ Historic England. "Church of St Mark (1083283)". National Heritage List for England. Retrieved 6 July 2011. ^ "Amcotts CE School". Lincs to the Past. Lincolnshire Archives. Retrieved 27 August 2011. ^ Historic England. "Marae DMV (60968)". PastScape. Retrieved 27 August 2011. ^ Marae/The Marshes in the Domesday Book. Retrieved 27 August 2011. ^ "Amcotts CP/Ch". Retrieved 27 August 2011. This page was last edited on 8 November 2018, at 12:11 (UTC).